The surprise twist at the ending looks to change everything. This is the best Peter & Sara story to date. Peter is pursuing his deadly plan. Sara remains conflicted about her relationship. But she does make a little progress toward getting Peter to listen to her opinions. They get an amazing ’get out of jail free’ deal, which Peter seems likely to have sabotaged for Himself, with a random act of vigilante Justice. And then the epilogue. Brings out the enemy who might destroy them all. Can’t wait for Book 4! A perfect end to a wonderful series! 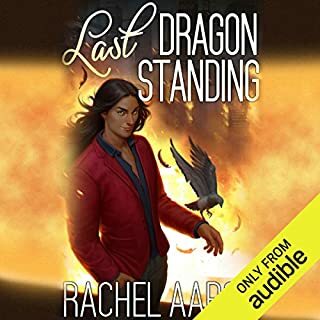 When I started listening to Last Dragon Standing yesterday I intended to listen for an hour and then put the book aside. The last Heartstrikers book was something something I wanted to take my time with. No such luck. I literally could not stop listening until the book was finished! Excited to see what Rachel will do next!